Finding mold on your property can be alarming. While small amounts might be easy to maintain yourself with regular and proper cleaning, but a large concentration of reoccurring mold or the spread of mold found on your property can be the result of an underlying issue. It’s important to determine the reason for mold growth and that’s where our technicians can help. Mold and mildew are more likely present in warm damp climates and poorly ventilated rooms where moisture is high. Bathrooms, basements, attics, kitchens, utility rooms, etc. are likely areas where you may see visible mold growth. 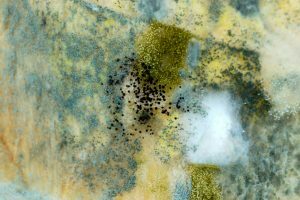 Mold can also be trapped in hard to get to places or even hidden behind surfaces. Determining where the excess moisture is, is crucial to determining the proper way to fix the issue. Drywall, tile and wood are all porous materials. When moisture buildup is high, it can create the perfect breeding ground for mold and mildew growth. Because of the porous nature of these materials, mold if even wiped away with a standard cleaning solution can still penetrate the finite cracks and crevasses without being completely removed which can cause more growth and eventual staining, rot, and decay of the material. Mold can be an irritant to your health as well. While we our bodies can withstand a lot, mold in large amounts can cause respiratory issues and distress especially to young children, elderly adults and individuals with asthma, as their immune systems are suppressed and easily susceptible to irritants. Because of the destruction of your property and potential health issues that mold can cause, it’s recommended to have mold professionally remediated from your property. Hiring a certified remediation and restoration company will ensure that your property is cleaned to IICRC and AQI standards. Through the use of proper cleaning solutions, tools and safety gear your property will be fully cleared of mold spores. Professional mold technicians will have the tools to inspect your property and fully assess the extent of the damage. While you may have visible mold, there could be moisture pockets trapping mold within walls, under floorboards, in concrete, etc. With expert tools, technicians can measure the moisture levels on your property and determine weak and problematic areas that can indicate corrosion or mold buildup. Once determined a thorough inspection will need to be completed to evaluate the extent of spread. With 24-hour emergency response, the Alert Disaster Restoration team will be there for you if your property has experienced a roof leak to a sewage backup. Our certified professionals can help reduce your stress and burden of the devastation and limit the amount of damage to your property. With air filtration and proper cleaning solutions based on the type of contamination and mold growth, our technicians will quickly and efficiently get to work on restoring your property. Don’t hesitate to call; as a full-service water damage, fire damage, reconstruction company, we’ll be there when you need us to return your property to its pre-loss condition.